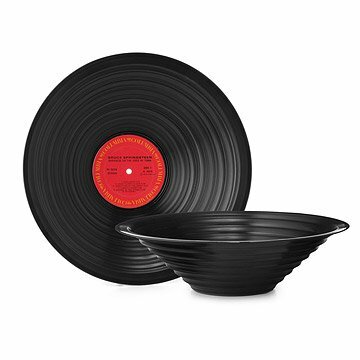 Set the party spinning with these classic LPs turned into decorative bowls by artist Jeff Davis. "Happy Days Are Yours and Mine"
Choose from Rock & Roll, Showtunes, Crooner, Diva, 80's, R&B, Disco, Jazz, Hip Hop, or Folk bowls. All bowls come in either the traditional smooth design or the modern stepped design. Completely sealed. Handmade in Philadelphia. Due to the reclaimed nature of the records, we cannot recommend serving food directly from the bowls. Not dishwasher safe. Sorry, no choice of artist. Hand wash with damp cloth. Looked great! Would be awesome if we could pick the record. I'm not quite sure the point of this product. It's not a bowl because it's an actual record and has a hole in the bottom and it's too deep to be on the wall. It's literally pointless and a waste of money. What a great gift item! What a fun product. I'm giving it as a gift and I filled it with chocolate wrapped ornaments. The recipient is an avid music lover and accapella singer. I think it's perfect. Fun filled with treats and fun empty too! This was gift for our future son-in-law, who is a huge music buff! He loved it. I gave it as a gift, and my friend REALLY said he likes it! Great retro design. Cool addition to any kitchen or living room!